How Are You Doing On Your New Years Resolutions? I hope you are doing great! We are a little over one month into the new year…how are you progressing on your New Years Resolutions? Or New Years Revolution, as I like to call it. Here’s what typically happens: We are flush with excitement when the New Year rolls around. We make some goals and for a few days we stay on track. Then, a week or two go by and the changes seem more difficult to maintain. Slowly, you revert back to your old habits. Then you get discouraged and depressed. You get more discouraged and by the end of January, you give up altogether. I see this every year in my fitness business, too. We are full in boot camp in January and by February a good percentage of the new members fall off. I get it. We are human, after all, and let’s face it; new habits are hard to hang on to. Especially if you are trying to replace old habits ingrained after years, if not decades of use. But, then again, people do change. I’ve had a couple members lose over 100 pounds during the course of a year. Talk about a huge lifestyle change!!! So, how can we maintain changes that we started with such good intentions? First, you have to take action. Yes, there is great value in thinking about what you want to change and how you might do it. But, the bottom line is you have to do something in pursuit of those goals. 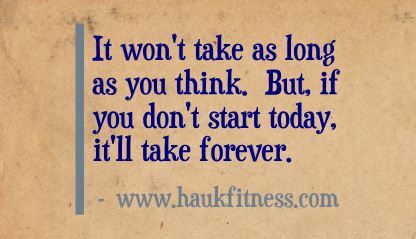 Whether it’s a slower start like taking a 15-20 minute walk three times a week or jumping into boot camp. Get up and go! Second, if your goal is to get healthy and get fit; studies show that working out with a group is the best way to go. You will feel more accountable and you will enjoy the experience more. Third, when you feel your motivation start to wane a little, recognize this and reach out; whether it’s to your trainer, your spouse, friends, etc. Communicate this and you will be amazed at how much support you will get. The motivation will come right back. And finally, defer your gratification. Be realistic about how long it will take. I will tell you this; it doesn’t take nearly as long as you imagine. But, then again, it’s not going to happen in two or three weeks. Be consistent and persistent. Changes are happening each and every day. Some changes are subtle and some are very obvious. 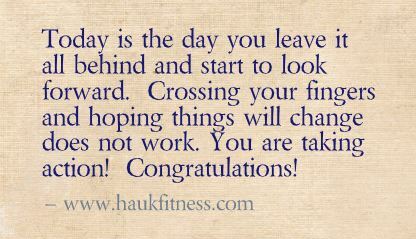 Let those changes sink in and keep your momentum going. Set your alarm, grab your workout clothes and join us! I know it doesn’t seem like it yet, but spring is truly right around the corner! 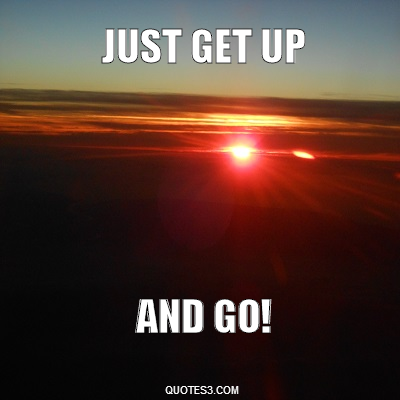 Get up and go!